Fri 15th – Mon 18th February 2008. Ken McMaster’s (pictured) Yarra Junction Fiddler’s Convention has been running for 23 years in a block of bushland called ‘Camp Eureka’ an hour from Melbourne Vic. Bluegrass and Ol’ Timey musicians camp for the weekend to catch up with friends, play music and enjoys dances and performances for three days. 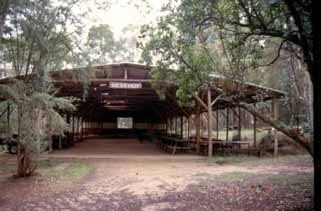 ‘Camp Eureka’ now over 60 years old, is the last surviving campsite in Australia used by the Eureka Communist League. The Campsite in the Yarra Ranges was originally a farmhouse of which only the barn remains. The land was given to the Eureka Communist League in 1945. Head over to ‘Camp Eureka’ and find yourself a bit of cleared bush, set up camp and commence to picking. This is a rustic festival atmosphere for lovers of both music and camping. Yarra Junction Convention features old-timey, bluegrass concerts, workshops, lots of jamming and dances. The camp is located on Tarrango Road Wesburn, 5 klm past Yarra Junction. Inquiries: – Ken McMaster’s mobile – 0419 580 642 or email.